How to correct heel strike running? When it comes to preventing running injuries, avoiding heel strike is important, but ankle plantar-flexion of the foot at touchdown is more important because it is the best trick to allow a proper forefoot strike landing. So, what the heck is ‘ankle plantarflexion’? 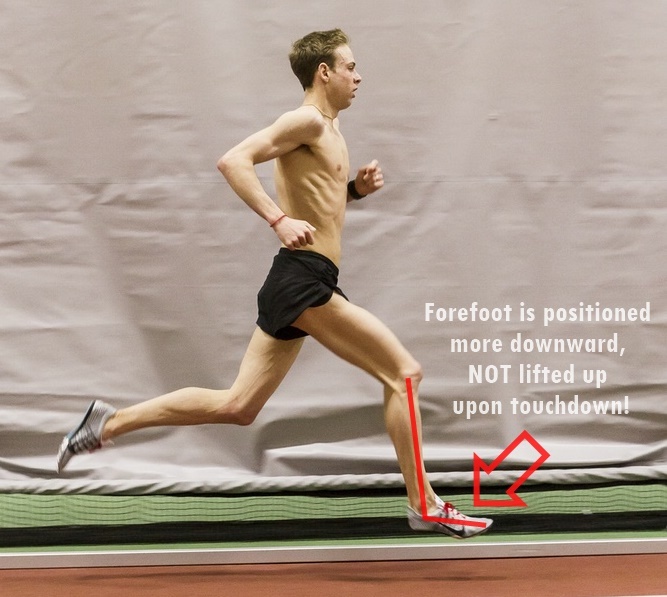 Galen Rupp (shown below) gives the BEST example as to how ankle plantar-flexion of the foot looks like when forefoot running. Ankle plantar-flexion is essentially pointing your forefoot and toes downwards just before your forefoot strikes the ground. 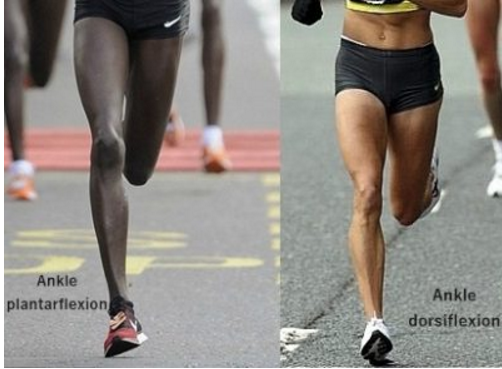 Ankle plantar-flexion gives forefoot running a functional advantage over ankle dorsiflexion in heel strike running. In short, ankle dorsi- and plantar flexion describes the orientation of the foot relative to the ground throughout the gait cycle of running. 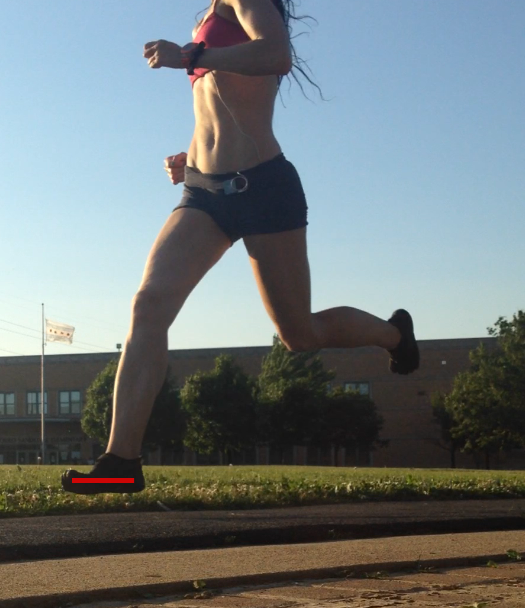 Ankle plantar-flexion at touchdown in forefoot running helps reduce braking and allows an easier transition into stance. It is important to note that the specific orientation of the foot at touchdown can have either a positive or negative effect on joint moment distribution of the lower leg during running. Above left, a plantarflexed ankle at touchdown in a forefoot strike. Above right, a dorsiflexed ankle at touchdown in a heel strike. It is because of ankle plantar flexion at touchdown that forefoot running is safer and less energetically costly compared to ankle dorsiflexion at touchdown in heel strike running. For one, ankle plantar flexion at touchdown minimizes negative work and torque on the knee in forefoot running. A study by Sinclair (2010) revealed that greater ankle plantar flexion at touchdown is a mechanism to reduce patellofemoral joint force and knee pressure during forefoot running. Other researchers speculate that greater plantar flexion moments in forefoot running allows more energy storage within the Achilles tendon, thereby increasing mechanical efficiency as compared with heel strike running. In forefoot, ankle plantar flexion at touchdown promotes a more vertical leg segment, meaning that the stance leg is near the center of mass, resulting in less tibial shock accelerations and braking. In contrast, ankle dorsiflexion at touchdown in heel strike running may result in a more titled leg segment which not only increases braking, but increases knee-joint loads and torque, resulting in higher patellofemoral joint stress. Moreover, high ankle dorsiflexion at touchdown requires the tibialis anterior to decelerate plantar flexion which leads to greater anterior compartment pressure in the lower leg (Diebal et al., 2012). Ankle dorsiflexion at touchdown represents a biomechanical flaw which cushioned athletic footwear is responsible for. Countless studies show that athletic footwear with thick under-heel cushioning facilitates ankle dorsiflexion at touchdown, whereas barefoot running shoes promote greater ankle plantar flexion. Therefore, the destiny of your foot strike mechanics is determined by athletic footwear. The key is to know what you are doing to employ the right landing tactics, but you must do so in a minimalist shoe or barefoot also. De Wit et al. Biomechanical analysis of the stance phase during barefoot and shod running. J Biomech, 2000; 33:269-78. Diebal, AR,Gregory R,Alitz C,Gerber JP.Forefoot running improves pain and disability associated with chronic exertional compartment syndrome. Am J Sports Med 2012;40:1060–7. Sinclar, J. Effects of barefoot and barefoot-inspired footwear on knee and ankle loading during running. Clin Biomech, 2014; 26:395-99. TenBroek et al. Effect of unknown footwear midsole thickness on running kinematics within initial six minutes of running. Footwear Sci, 2013; 5(1):27-37.